Abstract: Chromosome 22q11 is characterized by the presence of chromosome-specific low-copy repeats or segmental duplications. This region of the chromosome is very unstable and susceptible to mutations. The misalignment of low-copy repeats during nonallelic homologous recombination leads to the deletion of the 22q11.2 region, which results in 22q11 deletion syndrome (22q11DS). The 22q11.2 deletion is associated with a wide variety of phenotypes. The term 22q11DS is an umbrella term that is used to encompass all 22q11.2 deletion-associated phenotypes. 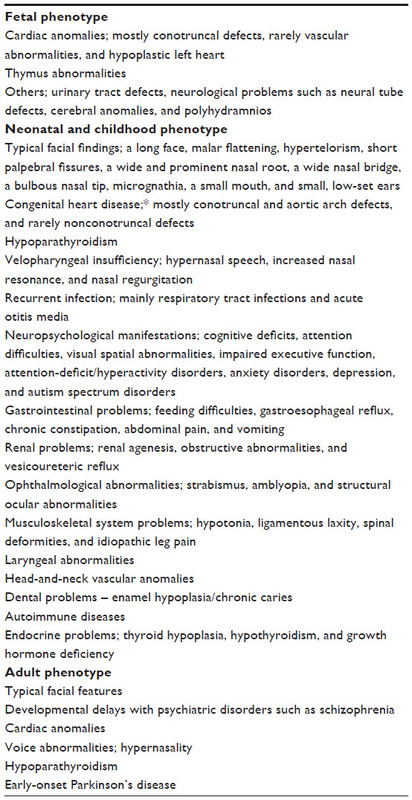 The haploinsufficiency of genes located at 22q11.2 affects the early morphogenesis of the pharyngeal arches, heart, skeleton, and brain. TBX1 is the most important gene for 22q11DS. This syndrome can ultimately affect many organs or systems; therefore, it has a very wide phenotypic spectrum. An increasing amount of information is available related to the pathogenesis, clinical phenotypes, and management of this syndrome in recent years. This review summarizes the current clinical and genetic status related to 22q11DS. Congenital absence of a thymus and parathyroid gland was reported by Dr Angelo M DiGeorge in 1965. Later, cardiac anomalies were added to the phenotype, and the syndrome was named DiGeorge syndrome (DGS; Mendelian Inheritance in Man [MIM] number 188400).1 Most patients with DGS have monosomic deletions on the long arm of chromosome 22. This deletion might present with a variety of phenotypes, including DGS and velocardiofacial syndrome. 22q11 deletion syndrome (22q11DS) is an umbrella term that describes various clinical phenotypes.2,3 22q11DS is the most common microdeletion syndrome in humans, although it is likely to be more prevalent than reported and underrecognized because of its inherent clinical variability and heterogeneity. 22q11DS can affect many organs and systems.4,5 An increasing amount of information has been reported regarding the pathogenesis, clinical phenotypes, and management of this syndrome in recent years. This review summarizes the current clinical and genetic status of 22q11DS. A long-arm deletion of chromosome 22 might present with a variety of phenotypes, including DGS, velocardiofacial syndrome (MIM number 192430), conotruncal anomaly face syndrome (MIM number 217095) (or Takao syndrome), and isolated outflow tract (OFT) defects of the heart.2 CATCH22 (Cardiac Abnormality/abnormal facies, T-cell deficit due to thymic hypoplasia, Cleft palate, Hypocalcemia due to hypoparathyroidism resulting from 22q11 deletion) was proposed as a collective acronym for these differing presentations of a common genetic etiology.2,3 Many clinicians believe that 22q11.2 deletion is a single syndrome rather than several distinct syndromes.2 Therefore, the term 22q11DS is an umbrella term used to describe all deletion-associated phenotypes. The term 22q11DS is used in this review to cover all of the phenotypic variations described before. 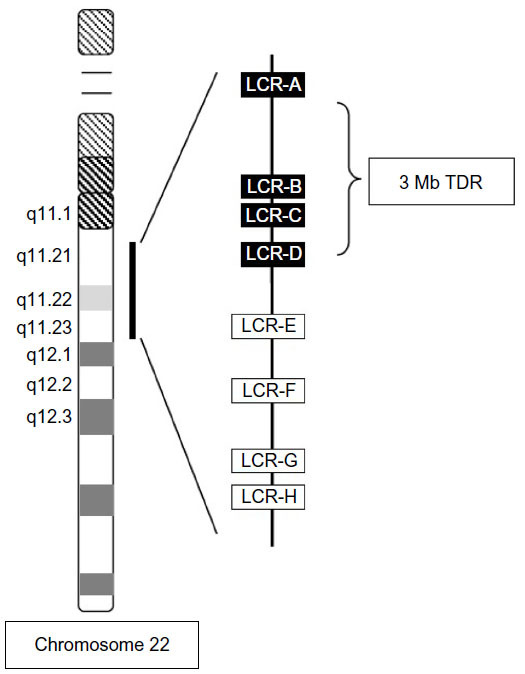 Figure 1 Schematic view of chromosome 22 indicating the position of the low-copy repeats in 22q11.2. Abbreviations: LCR, low-copy repeat; TDR, typically deleted region. Figure 2 Genes in the typically deleted region of chromosome 22. Note: The typical 3 Mb deletion occurs between the most proximal (LCR22-A) and most distal (LCR22-D) units. Abbreviation: LCR22, chromosome 22-specific LCR. Various pathways downstream of TBX1 and modifiers of TBX1 activity seem to play an important role in the pathogenesis of 22q11DS. TBX1 regulates the expression of several growth factors and transcription factors, including FGF8, FGF10, PITX2, CHD7, VEFR3, EYA1, WNT5A, BMPER, and Otog-MyoD.18,19 Disruption of the expression of these genes by the loss of function of TBX1 contributes to the pathogenesis of 22q11DS. TBX1 expression is regulated negatively by retinoic acid, and positively by SHH via FOXA2.17–19 The manipulation of these pathways might be a cornerstone of future advances in 22q11DS. 22q11DS presents with a very wide phenotypic spectrum, including the following: facial dysmorphisms; congenital cardiac defects; velopharyngeal insufficiency with or without cleft palate; thymic hypoplasia; immune deficiency; parathyroid hypoplasia; developmental delay; learning disabilities; psychiatric disorders; renal, ocular, and skeletal malformations; hearing loss; and laryngeal abnormalities. The phenotypes associated with the syndrome might be recognized during the prenatal period, or in newborns, children, and even adults.31–33 Clinical phenotypes of 22q11DS are summarized in Table 1. Note: *Tetralogy of Fallot is the most prevalent cardiac defect, but interrupted aortic arch type B is the most specific defect for 22q11 deletion syndrome. Congenital heart defects are the major prenatal sonographical feature of 22q11 deletions. Among these, conotruncal defects are the most common cardiac anomalies, although vascular abnormalities and hypoplastic left hearts were also reported.34 Thymus abnormalities are also an important prenatal sonographic feature of this syndrome. Urinary tract defects, neurological problems such as neural tube defects, cerebral anomalies, and polyhydramnios have also been reported.35 However, facial anomalies in fetuses are difficult to diagnose. Figure 3 Characteristic facial features might not be recognized easily. Notes: Prominent nose with a bulbous tip, small mouth and eyes, and long face in a patient diagnosed with 22q11DS. He also had hypoparathyroidism and attention deficit. The optimal management of patients with 22q11DS requires a comprehensive team approach, including specialists in genetics, pediatrics, endocrinology, plastic surgeons, immunologists, otolaryngologists, and speech therapists. 22q11DS is not a rare syndrome, and there is a need to form a local specialist team to ensure optimal management of affected patients. Appropriate guidelines for the management of patients are available in the literature, which contain useful information for physicians interested in 22q11DS syndrome.31,32,71 22q11DS might be difficult to recognize and diagnose in some patients, although the clinical findings for early diagnosis are known. Early diagnosis provides the best opportunity for modifying the course of the illness and optimizing patient outcome. The authors report no conflicts of interest in this review. DiGeorge AM. Discussions on a new concept of the cellular basis of immunology. J Pediatr. 1965;67(5):907–908. Kobrynski LJ, Sullivan KE. Velocardiofacial syndrome, DiGeorge syndrome: the chromosome 22q11.2 deletion syndromes. Lancet. 2007;370(9596):1443–1452. McDonald-McGinn DM, Sullivan KE. Chromosome 22q11.2 deletion syndrome (DiGeorge syndrome/velocardiofacial syndrome). Medicine (Baltimore). 2011;90(1):1–18. Tézenas Du Montcel S, Mendizabai H, Aymé S, Lévy A, Philip N. Prevalence of 22q11 microdeletion. J Med Genet. 1996;33(8):719. Kimberley AM. FISH diagnosis of 22q11.2 deletion syndrome. Newborn Infant Nurs Rev. 2008;8:e11–e19. Yu S, Graf WD, Shprintzen RJ. Genomic disorders on chromosome 22. Curr Opin Pediatr. 2012;24(6):665–671. Emanuel BS. Molecular mechanisms and diagnosis of chromosome 22q11.2 rearrangements. Dev Disabil Res Rev. 2008;14(1):11–18. Hurles M. How homologous recombination generates a mutable genome. Hum Genomics. 2005;2(3):179–186. Gu W, Zhang F, Lupski JR. Mechanisms for human genomic rearrangements. Pathogenetics. 2008;1(1):4. Dittwald P, Gambin T, Gonzaga-Jauregui C, et al. Inverted low-copy repeats and genome instability – a genome-wide analysis. Hum Mutat. 2013;34(1):210–220. Pavlicek A, House R, Gentles AJ, Jurka J, Morrow BE. Traffic of genetic information between segmental duplications flanking the typical 22q11.2 deletion in velo-cardio-facial syndrome/DiGeorge syndrome. Genome Res. 2005;15(11):1487–1495. Cole CG, McCann OT, Collins JE, et al. Finishing the human chromosome 22 sequence. Genome Biol. 2008;9(5):R78. Delio M, Guo T, McDonald-McGinn DM, et al. Enhanced maternal origin of the 22q11.2 deletion in velocardiofacial and DiGeorge syndromes. Am J Hum Genet. 2013;92(3):439–447. Gao S, Li X, Amendt BA. Understanding the role of TBX1 as a candidate gene for 22q11.2 deletion syndrome. Curr Allergy Asthma Rep. 2013; 13(6):613–621. Scambler PJ. 22q11 deletion syndrome: a role for TBX1 in pharyngeal and cardiovascular development. Pediatr Cardiol. 2010;31(3):378–390. Gao S, Moreno M, Eliason S, et al. TBX1 protein interactions and microRNA-96-5p regulation controls cell proliferation during craniofacial and dental development: implications for 22q11.2 deletion syndrome. Hum Mol Genet. 2015;24(8):2330–2348. Rana MS, Théveniau-Ruissy M, De Bono C, et al. TBX1 coordinates addition of posterior second heart field progenitor cells to the arterial and venous poles of the heart. Circ Res. 2014;115(9):790–799. Castellanos R, Xie Q, Zheng D, Cvekl A, Morrow BE. Mammalian TBX1 preferentially binds and regulates downstream targets via a tandem T-site repeat. PLoS One. 2014;9(5):e95151. Scambler PJ. The 22q11 deletion syndromes. Hum Mol Genet. 2000; 9(16):2421–2426. Sinha T, Li D, Théveniau-Ruissy M, Hutson MR, Kelly RG, Wang J. Loss of Wnt5a disrupts second heart field cell deployment and may contribute to OFT malformations in DiGeorge syndrome. Hum Mol Genet. 2015;24(6):1704–1716. Karpinski BA, Maynard TM, Fralish MS, et al. Dysphagia and disrupted cranial nerve development in a mouse model of DiGeorge (22q11) deletion syndrome. Dis Model Mech. 2014;7(2):245–257. Meechan DW, Maynard TM, Tucker ES, LaMantia AS. Three phases of DiGeorge/22q11 deletion syndrome pathogenesis during brain development: patterning, proliferation, and mitochondrial functions of 22q11 genes. Int J Dev Neurosci. 2011;29(3):283–294. Raux G, Bumsel E, Hecketsweiler B, et al. Involvement of hyperprolinemia in cognitive and psychiatric features of the 22q11 deletion syndrome. Hum Mol Genet. 2007;16(1):83–91. Marom T, Roth Y, Goldfarb A, Cinamon U. Head and neck manifestations of 22q11.2 deletion syndromes. Eur Arch Otorhinolaryngol. 2012;269(2):381–387. Rosa RF, Rosa RC, Dos Santos PP, Zen PR, Paskulin GA. Hematological abnormalities and 22q11.2 deletion syndrome. Rev Bras Hematol Hemoter. 2011;33(2):151–154. Botto LD, May K, Fernhoff PM, et al. A population-based study of the 22q11.2 deletion: phenotype, incidence, and contribution to major birth defects in the population. Pediatrics. 2003;112(1 pt 1):101–107. Devriendt K, Fryns JP, Mortier G, van Thienen MN, Keymolen K. The annual incidence of DiGeorge/velocardiofacial syndrome. J Med Genet. 1998;35(9):789–790. Vogels A, Schevenels S, Cayenberghs R, et al. Presenting symptoms in adults with the 22q11 deletion syndrome. Eur J Med Genet. 2014;57(4):157–162. Sandrin-Garcia P, Macedo C, Martelli LR, et al. Recurrent 22q11.2 deletion in a sibship suggestive of parental germline mosaicism in velocardiofacial syndrome. Clin Genet. 2002;61(5):380–383. Kitsiou-Tzeli S, Kolialexi A, Fryssira H, et al. Detection of 22q11.2 deletion among 139 patients with Di George/velocardiofacial syndrome features. In Vivo. 2004;18(5):603–608. Bassett AS, McDonald-McGinn DM, Devriendt K, et al; International 22q11.2 Deletion Syndrome Consortium. Practical guidelines for managing patients with 22q11.2 deletion syndrome. J Pediatr. 2011;159(2):332–339. Habel A, Herriot R, Kumararatne D, et al. Towards a safety net for management of 22q11.2 deletion syndrome: guidelines for our times. Eur J Pediatr. 2014;173(6):757–765. Cancrini C, Puliafito P, Digilio MC, et al; Italian Network for Primary Immunodeficiencies. Clinical features and follow-up in patients with 22q11.2 deletion syndrome. J Pediatr. 2014;164(6):1475–1480. Noël AC, Pelluard F, Delezoide AL, et al. Fetal phenotype associated with the 22q11 deletion. Am J Med Genet A. 2014;16(11):2724–2731. Momma K. Cardiovascular anomalies associated with chromosome 22q11.2 deletion syndrome. Am J Cardiol. 2010;105(11):1617–1624. Hacıhamdioğlu B, Berberoğlu M, Şiklar Z, et al. 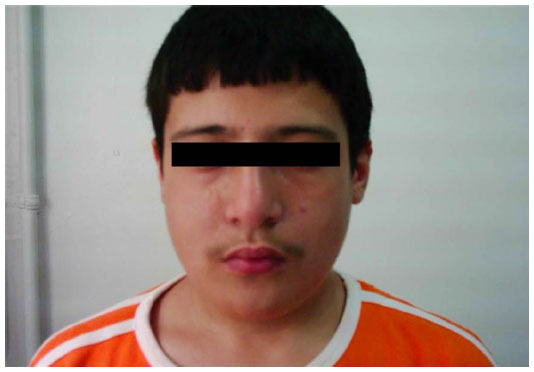 Case report: two patients with partial DiGeorge syndrome presenting with attention disorder and learning difficulties. J Clin Res Pediatr Endocrinol. 2011;3(2):95–97. Bertola G, Giambona S, Bianchi R, Girola A, Berra SA. Sindrome di Di George: una diagnosi non sempre pediatrica. [Di George syndrome: not always a pediatric diagnosis]. Recenti Prog Med. 2013; 104(2):69. Italian. Lima K, Abrahamsen TG, Wolff AB, et al. Hypoparathyroidism and autoimmunity in the 22q11.2 deletion syndrome. Eur J Endocrinol. 2011;165(2):345–352. Cheung EN, George SR, Costain GA, et al. Prevalence of hypocalcaemia and its associated features in 22q11·2 deletion syndrome. Clin Endocrinol (Oxf). 2014;81(2):190–196. Cheung EN, George SR, Andrade DM, Chow EW, Silversides CK, Bassett AS. Neonatal hypocalcemia, neonatal seizures, and intellectual disability in 22q11.2 deletion syndrome. Genet Med. 2014;16(1):40–44. Matarazzo P, Tuli G, Fiore L, et al. Teriparatide (rhPTH) treatment in children with syndromic hypoparathyroidism. J Pediatr Endocrinol Metab. 2014;27(1–2):53–59. Tsirikos AI, Khan LA, McMaster MJ. Spinal deformity in patients with DiGeorge syndrome. J Spinal Disord Tech. 2010;23(3):208–214. Maggadottir SM, Sullivan KE. The diverse clinical features of chromosome 22q11.2 deletion syndrome (DiGeorge syndrome). J Allergy Clin Immunol Pract. 2013;1(6):589–594. Baker K, Vorstman JA. Is there a core neuropsychiatric phenotype in 22q11.2 deletion syndrome? Curr Opin Neurol. 2012;25(2):131–137. Demily C, Rossi M, Schneider M, et al. Neurocognitive and psychiatric management of the 22q11.2 deletion syndrome. Encephale. Epub 2014 Dec 15. Schneider M, Debbané M, Bassett AS, et al; International Consortium on Brain and Behavior in 22q11.2 Deletion Syndrome. Psychiatric disorders from childhood to adulthood in 22q11.2 deletion syndrome: results from the International Consortium on Brain and Behavior in 22q11.2 Deletion Syndrome. Am J Psychiatry. 2014;171(6):627–639. Persson C, Friman V, Óskarsdóttir S, Jönsson R. Speech and hearing in adults with 22q11.2 deletion syndrome. Am J Med Genet A. 2012; 158(12):3071–3079. Ruda JM, Krakovitz P, Rose AS. A review of the evaluation and management of velopharyngeal insufficiency in children. Otolaryngol Clin North Am. 2012;45(3):653–669. Gennery AR. Immunological aspects of 22q11.2 deletion syndrome. Cell Mol Life Sci. 2012;69(1):17–27. Björk AH, Óskarsdóttir S, Andersson BA, Friman V. Antibody deficiency in adults with 22q11.2 deletion syndrome. Am J Med Genet A. 2012;158A(8):1934–1940. Oskarsdóttir S, Holmberg E, Fasth A, Strömland K. Facial features in children with the 22q11 deletion syndrome. Acta Paediatr. 2008;97(8):1113–1137. Stagi S, Lapi E, Gambineri E, et al. Thyroid function and morphology in subjects with microdeletion of chromosome 22q11 (del(22)(q11)). Clin Endocrinol (Oxf). 2010;72(6):839–844. Weinzimer SA. Endocrine aspects of the 22q11.2 deletion syndrome. Genet Med. 2001;3(1):19–22. Fung WL, Chow EW, Webb GD, Gatzoulis MA, Bassett AS. Extracardiac features predicting 22q11.2 deletion syndrome in adult congenital heart disease. Int J Cardiol. 2008;131(1):51–58. Butcher NJ, Kiehl TR, Hazrati LN, et al. Association between early-onset Parkinson disease and 22q11.2 deletion syndrome: identification of a novel genetic form of Parkinson disease and its clinical implications. JAMA Neurol. 2013;70(11):1359–1366. Monteiro FP, Vieira TP, Sgardioli IC, et al. Defining new guidelines for screening the 22q11.2 deletion based on a clinical and dysmorphologic evaluation of 194 individuals and review of the literature. Eur J Pediatr. 2013;172(7):927–945. Fernández L, Lapunzina P, Arjona D, et al. Comparative study of three diagnostic approaches (FISH, STRs and MLPA) in 30 patients with 22q11.2 deletion syndrome. Clin Genet. 2005;68(4):373–378. Driscoll DA. Molecular and genetic aspects of DiGeorge/velocardiofacial syndrome. Methods Mol Med. 2006;126:43–55. Pretto D, Maar D, Yrigollen CM, Regan J, Tassone F. Screening newborn blood spots for 22q11.2 deletion syndrome using multiplex droplet digital PCR. Clin Chem. 2015;61(1):182–190. Horwitz MJ, Stewart AF. Hypoparathyroidism: is it time for replacement therapy? J Clin Endocrinol Metab. 2008;93(9):3307–3309. Chinn IK, Markert ML. Induction of tolerance to parental parathyroid grafts using allogeneic thymus tissue in patients with DiGeorge anomaly. J Allergy Clin Immunol. 2011;127(6):1351–1355. Hofstetter AM, Jakob K, Klein NP, et al. Live vaccine use and safety in DiGeorge syndrome. Pediatrics. 2014;133(4):946–954. Sullivan KE, Jawad AF, Randall P, et al. Lack of correlation between impaired T cell production, immunodeficiency, and other phenotypic features in chromosome 22q11.2 deletion syndromes. Clin Immunol Immunopathol. 1998;86(2):141–146. Repetto GM, Guzmán ML, Delgado I, et al. Case fatality rate and associated factors in patients with 22q11 microdeletion syndrome: a retrospective cohort study. BMJ Open. 2014;4(11):e005041. Carotti A, Digilio MC, Piacentini G, Saffirio C, Di Donato RM, Marino B. Cardiac defects and results of cardiac surgery in 22q11.2 deletion syndrome. Dev Disabil Res Rev. 2008;14(1):35–42. Leopold C, De Barros A, Cellier C, Drouin-Garraud V, Dehesdin D, Marie JP. Laryngeal abnormalities are frequent in the 22q11 deletion syndrome. Int J Pediatr Otorhinolaryngol. 2012;76(1):36–40. Kirschner RE, Baylis AL. Surgical considerations in 22Q11.2 deletion syndrome. Clin Plast Surg. 2014;41(2):271–282. Stransky C, Basta M, McDonald-McGinn DM, et al. Perioperative risk factors in patients with 22q11.2 deletion syndrome requiring surgery for velopharyngeal dysfunction. Cleft Palate Craniofac J. 2015;52(2):183–191. Kennedy WP, Mudd PA, Maguire MA, et al. 22q11.2 Deletion syndrome and obstructive sleep apnea. Int J Pediatr Otorhinolaryngol. 2014;78(8):1360–1364. Tarquinio DC, Jones MC, Jones KL, Bird LM. Growth charts for 22q11 deletion syndrome. Am J Med Genet A. 2012;158(11):2672–2681. Fung WL, Butcher NJ, Costain G, et al. Practical guidelines for managing adults with 22q11.2 deletion syndrome. Genet Med. Epub 2015 Jan 8.